For information down to Xian levels, besides our in progress map, the only viable alternative is in Simplified Chinese maps (That we are using as template for our map). 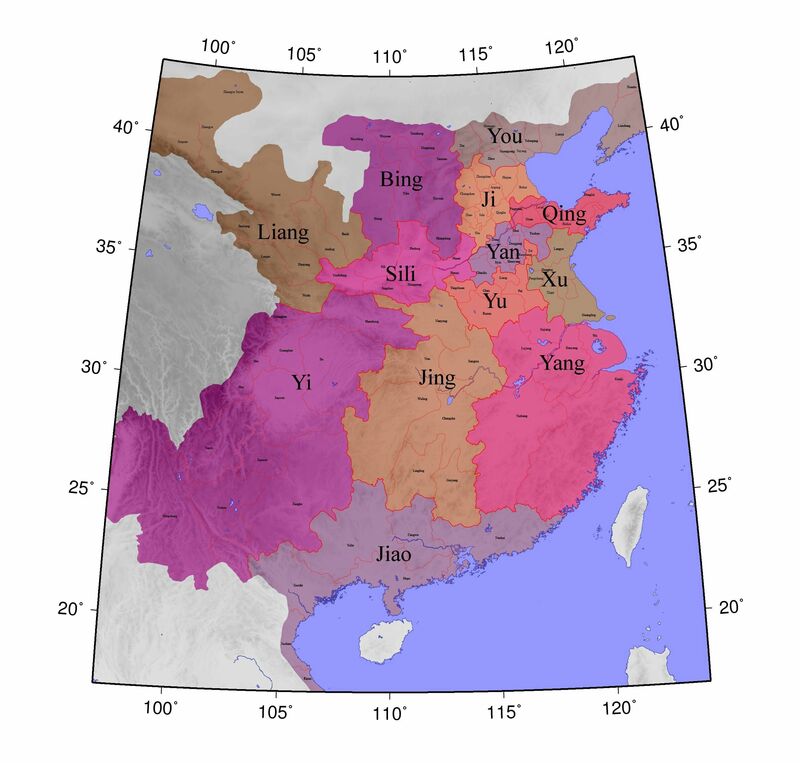 This website has all the maps for the Eastern Han period. This website has all the maps for the Three Kingdoms period. This website has all the maps for the Western Jin period. They are divided by which Zhou provinces they show. Thank you Jolt. That is incredibly helpful. Going by the map provided for the zhou and jun classification, where do the terms of Si Province and Yong Province come from then? The area I know as Si Province is made up of Hedong, Henan, Hongnong and Henei commanderies, Yong Province of Zuofengyi, Jingzhao, Youfufeng, Beidi, Anding, Hanyang, Longxi and probably Wudu (although I thought the latter belonged to Yi Province). On the map, Si Province and Yong Province are effectively devided into Sili and Liang. Koei for example often uses Si and Yong Provinces. Did they come up only later or so? Oh, and while I'm already asking questions. What exactly was the difference between the Governor and the Inspector of a province? Where they basically the same, just with a different name? What did a governor/inspector do? If they were different posts, could there be two at the same time or when would there be a governor or inspector? Were there certain provinces where there would always only be a governor or an inspector? I hope somebody could enlighten me. Lord_Cao_Cao wrote: Going by the map provided for the zhou and jun classification, where do the terms of Si Province and Yong Province come from then? On the Imperial Han Administrative hierarchy, Sili was not a normal province, with governors and inspectors, but the Imperial province per se. It was the Central Province, the center of the Empire, the center of the World. Yong province didn't exist to my knowledge, until the end of Han. Yongzhou only appeared as an administrative unit after Cao Cao's administrative reforms, which amalgamated Liangzhou with the three Fu commanderies (Jingzhao, Zuofengyi and Youfufeng). Cao Pi, on his accession, suppressed Sili Province, and split it between Jizhou, Yongzhou and Yuzhou. Only with the creation of Jin was Si Province restored, not as Sili, but as Sizhou. Lord_Cao_Cao wrote: Oh, and while I'm already asking questions. What exactly was the difference between the Governor and the Inspector of a province? Where they basically the same, just with a different name? What did a governor/inspector do? If they were different posts, could there be two at the same time or when would there be a governor or inspector? Were there certain provinces where there would always only be a governor or an inspector? I hope somebody could enlighten me. A Governor administered a province, and handled its day-to-day administrative duties. And he had no power to levy people or command armies. The Inspector was someone theoretically much closer to the Emperor. You can think of him as the Emperor's eye. He was there to observe any wrongdoings by the Governor or lesser administrative officials and report it back to the capital or carry out punishment accordingly. If there was a situation where it required major levies, only the Inspector had permission to raise the army. Thanks for the province clearup! So there were effectively both an inspector and a governor in a province? Did the inspector hold any military power if the governor wasn't allowed to command armies? The matter confuses me a bit because I've seen Liu Biao for example being refered to as both Inspector and Governor of Jing Province (same for Liu Zhang in Yi). Jolt wrote: A Governor administered a province, and handled its day-to-day administrative duties. And he had no power to levy people or command armies. I think one of us is confused, unless I'm totally misinterpreting what Rafe has to say in these two essays. Civil Administration and Military Organization. The other provinces were supervised by Inspectors [ci shi], with rank/salary of only Six Hundred shi. They had authority to enquire into the government of the commanderies and kingdoms within their territory, and they could report wrongdoing to the throne, but they could not normally take action on their own initiative. There were two exceptions to this limitation: in the far south of the empire, the Inspector of Jiaozhi [later known as Jiao province] had special executive rights on account of the distance and the difficulties of adequate communications; and on occasions when rebellion and banditry became sufficiently troublesome to require military forces from more than one commandery unit, the Inspector took command of the provincial levies and co-ordinated operations. In 188, in the aftermath of the Yellow Turbans rebellion, the government of Emperor Ling restored an earlier system, so that in some provinces Inspectors were replaced by Governors (mu). These were selected from men of ministerial rank, higher than that of the heads of commanderies, and they held executive rather than supervisory authority over the province. In the civil war which followed, therefore, the province rather than the commandery became the chief unit of military and civil power, and when Inspectors were appointed during this period they were usually lieutenants of a major warlord who had taken title as Governor in a neighbouring province. So from the sounds of it, most provinces had Inspectors. They kept their eyes on the commandery administrators and reported any wrondoing to the central government, but they had very little authority aside from this. In extreme circumstances, when there was some sort of threat that required the military forces of multiple commanderies, they could take command of the provincial troops and coordinated between the different commanders. Governors were a different story entirely. It was an old rank that was revived in 188 on Liu Yan's suggestion. Governors had much more authority to act on their own. Lord_Cao_Cao wrote: The matter confuses me a bit because I've seen Liu Biao for example being referred to as both Inspector and Governor of Jing Province (same for Liu Zhang in Yi). Sometimes, it's a question of translation. In most cases, the rank of cìshǐ (刺史) is usually translated as "Inspector", but some people go with the translation "Governor" instead. The rank of mù (牧) is usually translated as "Governor", though its literal meaning is more like "shepherd". On top of that, some people were originally given the title of Inspector and then promoted to be Governors later, which may have been the case for Liu Biao. Does anyone happen to have a list of governors and inspectors from the YTR onwards? Or were most cases simply not recorded? The original function of the cishi (Inspector, 刺史) was to serve as a roaming inspector, investigating and reporting acts of malfeasance by provincial officials. They had no authority to punish or reward officials, and were instead required to return to the capital four months out of the year to report what they had witnessed. Originally, the salary for cishi was a mere six hundred dan (石); far lower than the two thousand dan salary of commandery governors. During the Xiongnu incursions during the Eastern Han, the cishi's function was changed. Now, the cishi was set as the supervisor of the commandery governors with the full power as a supervisor. However, cishi still did not have the power to raise an army. You're confusing cishi's inspector role with the role played by the hufu (tiger tally, 虎符). Without both halves of a hufu (one half held by the local officials, the other by the central government), no one could raise any part of the army. This necessity for matching halves of the hufu from the central government was eliminated with the transition to zhoumu (州牧). The rank of zhoumu granted its holders both the autonomy and the responsibility to defend and protect the provinces they were assigned to. capnnerefir wrote: On top of that, some people were originally given the title of Inspector and then promoted to be Governors later, which may have been the case for Liu Biao. That is the case for Liu Biao. He was first appointed to the position of cishi by Dong Zhuo in the first year of Chuping (190) after Sun Jian killed the Wang Rui, the cishi. He was later promoted to zhoumu in the third of Chuping (193) by Li Jue and Guo Si. As for Liu Zhang ... it seems like one of Liu Yan's subordinates, Zhao Wei, petitioned the central government to appoint Liu Zhang as cishi to succeed Liu Yan. Zhao Wei had the intentions of seizing power for himself or governing through a weak Liu Zhang. The central government instead appointed Liu Zhang to the position of zhoumu, the rank held by his father. capnnerefir wrote: Sometimes, it's a question of translation. In most cases, the rank of cìshǐ (刺史) is usually translated as "Inspector", but some people go with the translation "Governor" instead. The rank of mù (牧) is usually translated as "Governor", though its literal meaning is more like "shepherd". The most popular translation of the Romance of the Three Kingdoms is by Robert Moss. Moss translates zhoumu as (Imperial) Protector. I think that's a better translation, as it denotes not only the greater role and responsibility of the official assigned to the post, above that of a cishi, but also because it prevents confusion with a taishou (Governor/Grand Administrator, 太守) of a Commandery or city. Lord_Cao_Cao wrote: That makes sense now, thanks! I've been working on a spreadsheet about that, but it's a little difficult to do for a number of reasons. While it is often mentioned when somebody is appointed as the Governor or Inspector of a province, it is often not recorded when that term ended. We sort of have to guess based on other appointments they received or when someone else took over, and this is kind of unreliable. Finding such appointments often means digging through individual biographies (since these appointments generally weren't important enough to render being mentioned in large-scale works like the ZZZTJ), and that's a lot of work. And there are a lot of biographies that aren't translated, which take me a whole lot longer to search through. Particularly during the first 10 years of the conflict (190-200), there were a lot of times when multiple people claimed to be the Governor or Inspector of the same province, having been given that title by rival warlords. In 191, Yu province had 3 or 4 different Inspectors/Governors at the same time. Jing and Yang remained contested territory until 280, with Inspectors appointed by Wei/Jin and Wu. Sometimes warlords appointed Inspectors/Governors to territories where they had no real authority (Wu and Shu often appointed people as governors of Wei's provinces) and this also confuses matters. A lot of provincial authorities are relatively minor figures who I've never even heard of, so in many cases I don't even know where to look. capnnerefir wrote: Jing and Yang remained contested territory until 280, with Inspectors appointed by Wei/Jin and Wu. The Jingzhou and Yangzhou of Wei/Jin and Wu were pretty much different provinces altogether once Wei and later Wu adopted the imperial administration. Wei/Jin's Jingzhou only consisted of most of the Han's Jingzhou, covering the majority of the north cutting off at Jiangling's area. Wei/Jin's Yangzhou only consisted of the Huainan area. The Governors/Inspectors of these provinces weren't expected to have any authority over what the other nation controlled. I don't remember this happening. Could you provide examples? @capnnerefir: I see. Well, I thought so. Thanks anyway. @Qu Hui: I think Liao Hua was once appointed Inspector of Bing Province although Shu didn't control it. I also think that Sun Quan appointed one of his officers as Inspector of Xu Province, but I'm neither sure, nor can I remember which officer that could have been.